An image of the original birth certificate is required to be uploaded into the athlete identification system by the gym owner or individual parent. Individual gym owners will make a decision for the parent or gym to upload. Note: Images of birth certificates will be verified and confirmed by USASF staff. For your protection, the image will be removed from our system files. Confirmation of date of birth can take several months during the registration period. A current photo will need to be uploaded by parent or gym owner. 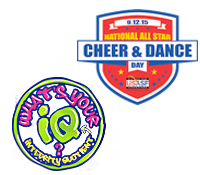 Any athlete that has competed on the floor with a team in any level from a Program (Primary Program), during the Worlds competition season (November 1 – May 1), will have to have a USASF Program Release Waiver signed by the owner of that gym (Primary Program) before that athlete is eligible to compete with another Program (Secondary Program) at the current season Cheerleading Worlds. The USASF Gym Release Waiver is located on the www.USASF.net website. This page is for athletes that are NEW to All Star. If you participated in All Star cheer and/or dance last season - DO NOT JOIN AS A NEW MEMBER. New Members Only - those athletes that did not participate in All Star cheer and/or dance.